The Ashmolean’s Jousef Jameel Centre for Islamic and Asian Art has a splendid online database of textiles. 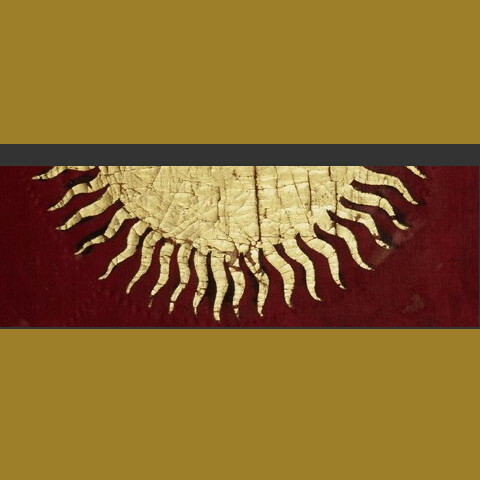 One of the collection’s superstars is this radiant sun, blazing at the centre of a 19th century Rajput royal flag. The colour is so full of muscle, it knocks you off your chair, and the simplicity of the composition will knock your socks off. So, there you are sprawling sockless in front of your Mac. Restore your dignity now, by researching some of the ancient textile fragments in the collection. You will see motifs that have been seminal in textile design for over two millenia all around the globe. It is an eye-opening experience for connoisseurs of Indonesian textiles. Many of the most coveted traditional Indonesian textile designs were inspired by Indian examples, many centuries ago. And that’s not surprising, when you consider the beauty of ancient Indian textiles, like this 13th-14th century Gujarati block print (above). Do you see a geringsing at all?